“When Gregor van der Berg and his team tapped into a natural gas reserve on Mars in 2057, the world collectively scrambled to find the source of this unexpected find. Unlike previous methane pockets, this one could not be explained through geological cause alone. Over the next two decades, the International Martian Research Station was established and manned in the Hypanis Vallis region. It wasn’t long before IMRS unearthed fossilized microbial life. The discovery of extinct extraterrestrials precipitated a renewed interest in the search for life outside the Solar System. “Six space agencies and two private companies cooperated to send out high-velocity interstellar probes to twelve nearby terrestrial planets, each one a promising candidate for life. Three of the Beagle probes, as they were called, went silent before reaching their destinations. Each of the remaining nine zoomed past their assigned planets, furiously gathering data all the while. As the 21st century came to a close, the first messages from the Barnard system reached Earth. Beagle 1 vanished shortly before the flyby but managed to capture several blurry photos of Tel Kabri and collect some preliminary data. Tel Kabri is tantalizingly Earthlike though much smaller, and many theorize that the probe was shot down. Little was known about Ur at the time the probes were disseminated. As exoplanet detection technologies improved, it became clear that Ur had experienced a runaway greenhouse effect and was uninhabitable. Oblivious, Beagle 8 soldiered on. Beagle 3 reached its target only to find that Cahokia was little more than a rock. The team’s astrobiologists were disappointed. The astrogeologists were not. The probes were programmed to position themselves between the planet and its star, but Beagle 3 suffered an anomaly that forced it to veer off course. Probes 11 and 12 journeyed together to Barnard’s Star, where two promising planets had been detected. Beagle 11 split off from its sister and changed course to fly past Avaris, which turned out to be a dud. Avaris was not the only Earth-sized planet to fail to pan out. 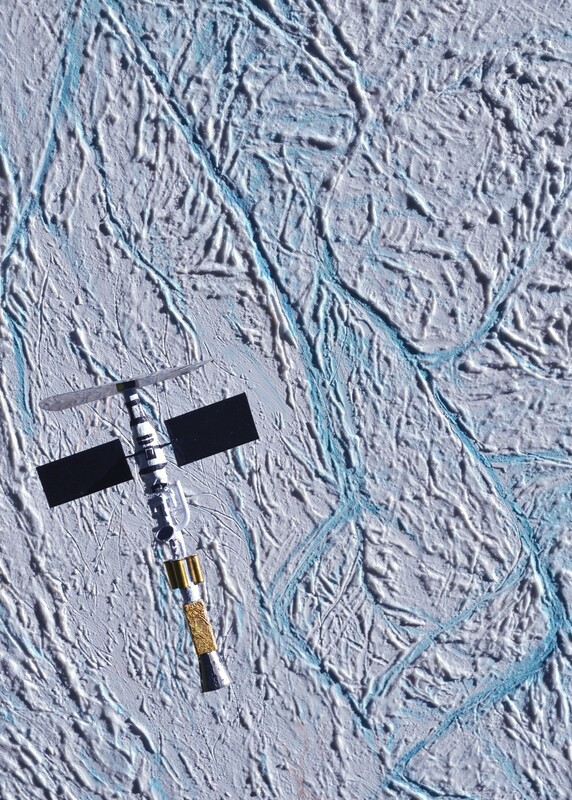 Vaishali, like Ilion, is tidally locked and rimmed with ice. The ice, however, is not made of water but frozen gasses, and the planet is much too cold to support life. As one of the last to reach its destination, Beagle 12 was under a good deal of pressure to find life. And find life, it did. The probes were outfitted with instruments sensitive to biosignatures, but Beagle 12 didn’t need these. Ilion’s biosphere was out in the open, visible to the naked eye from Beagle 12’s (very short-lived) vantage point. Beagle 4 was the only probe to successfully sample its planet’s atmosphere. Pompeii’s air was found to be thick with volcanic gasses and the world deemed habitable to extremophilic life, though no biological activity was confirmed. The super-Earth Yingchang was a long shot, but since so little was known about it, it was voted to be included in the program. Yingchang turned out to be a rocky planet with a tenuous atmosphere, not the water world many expected. Heracleion was the water world everyone expected. Its mass and radius were measured from Earth, and from that information planetary scientists deduced that it must have an ocean – and a deep one at that. 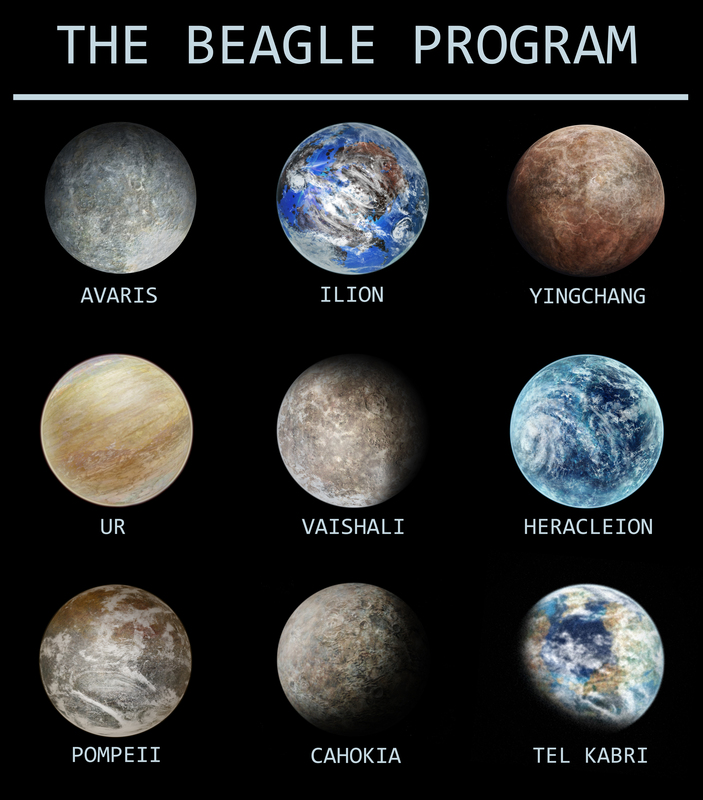 Beagle 5 gathered copious amounts of data but found no biosignatures. When news reached Earth of life flourishing around a nearby star, it was time to start thinking seriously about manned interstellar travel. The technology was ripe, but had yet to be tested – and so the Athena program was born. The intention was to send a crew of six to Saturn’s moon Enceladus while testing the technology that would soon be implemented in the Odyssey program. The Europe-built spacecraft Juffertje (damselfly) was the result, and the mission went smoothly. 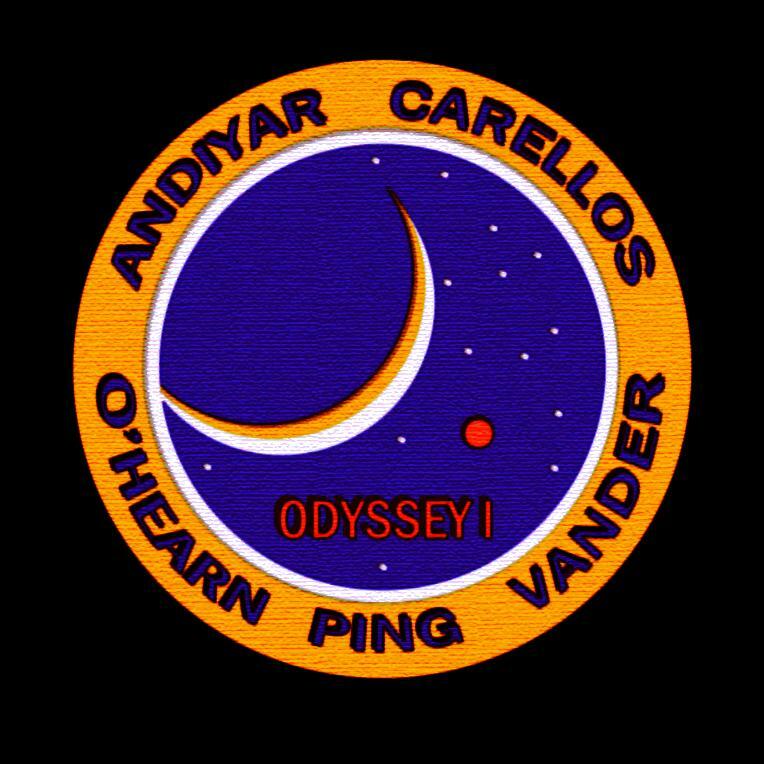 One of Athena’s flight engineers went on to command the first Odyssey mission. Although similar in shape (if not size), Odyssey and Juffertje differed in several key ways. The Saturn-bound ship lacked forward-facing thrusters, relying on aerobraking to slow down at its destination and firing its main thruster while flying in reverse to slow down at Earth. 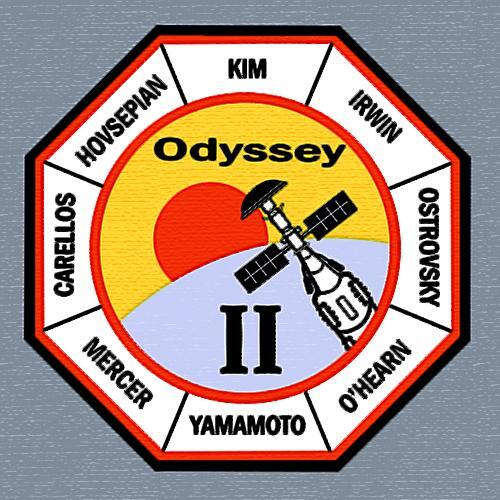 Odyssey’s prow shield was crucial for protecting the craft and crew from interstellar debris while flying at relativistic speeds. Juffertje’s prow shield served mainly as a radiator and a sail for aerobraking. On the way to Saturn, the crew of Juffertje spent most of their time in two pods that, when berthed to the Hab Node between the solar panels and prow shield, provided spin gravity. In this photo, they are not visible, and that is for a good reason: the pods doubled as landers. 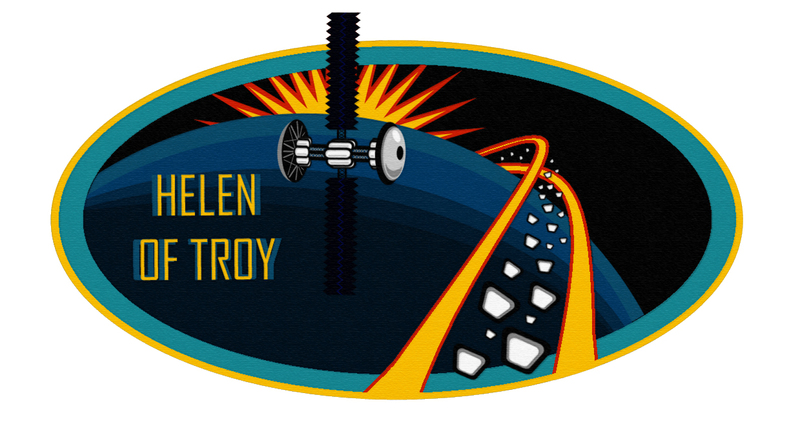 Because a large portion of each landing module had to be left behind on the surface of Enceladus, the crew lived in microgravity for a majority of their return to Earth. 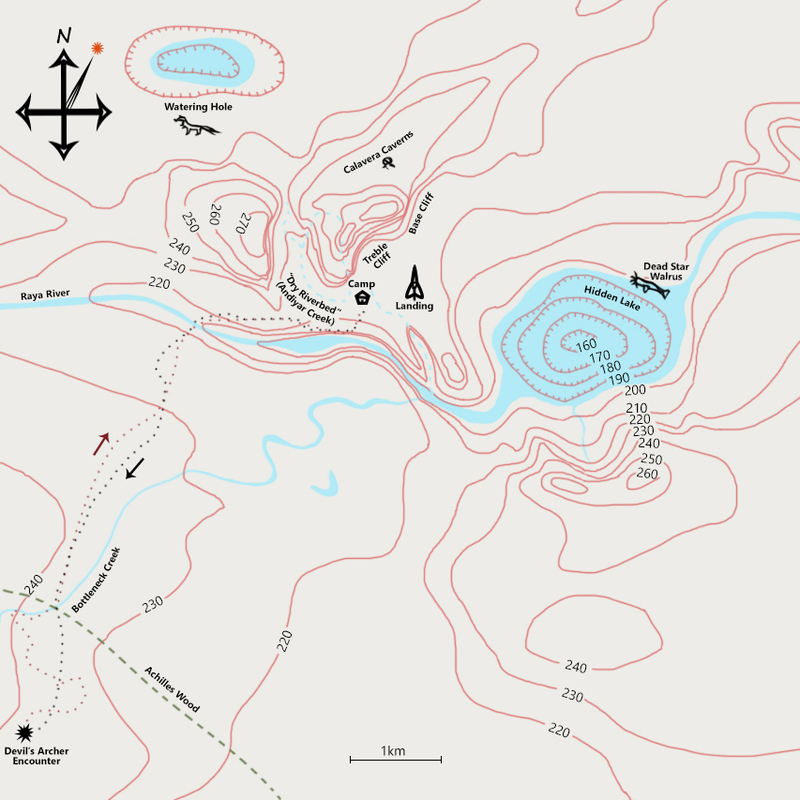 Capillary Creek and Thrace Canyon, two areas explored by the Odyssey III ground crew. 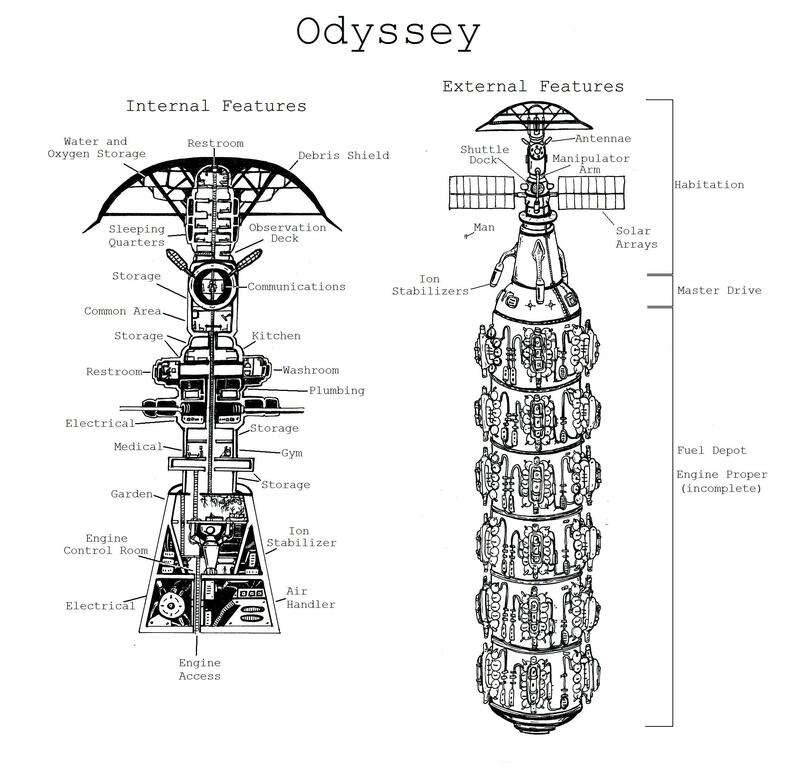 This diagram shows the interstellar ship Odyssey in its third incarnation. The ship provides artificial gravity to the crew by accelerating halfway and decelerating the other half. This means that its structure must be able to hold its weight in both directions for up to 2g of acceleration. Unlike other proposed designs, this ship was not meant to turn around before decelerating. The thrusters simply fire in the opposite direction. As a result, the floor becomes the ceiling at that halfway point, and the ship’s interior must be designed accordingly. The ladders go all the way up the walls, the toilet and shower modules can rotate, and the furniture can be bolted to either the floor or the ceiling. All of these modifications are performed in weightlessness, during that brief transition between acceleration and deceleration, and while the ship is parked in Ilion’s or Earth’s orbit. A second toilet sits just below the debris shield. It is rated for zero-g, but it can be used at other times in a pinch. The medical waste disposal chute can also be used during systemwide plumbing failures. Power is supplied by solar arrays when possible, and by the engine itself when not. Batteries can store up to six days of power. An engine failure lasting longer than six days can render the ship uninhabitable. It is for this reason that at least one seasoned engineer, traditionally the mission’s commander, must remain on board while the rest of the crew explores the planet’s surface. The outside view shows Odyssey with half of its complement of fuel cells. Each has four thrusters associated with it and a set of small radiators (not shown) to vent the heat. As fuel runs down, segments are jettisoned until only six remain. The final leg of each mission always ends in a passive fall towards Sol, guided occasionally by gentle nudges from the supplementary ion drives. Helen of Troy was humanity’s answer to the mistakes it made while investigating Ilion. Never one to leave pristine land untouched, the first wave of explorers – on the Odyssey missions – left behind a giant footprint in the form of invasive cardamom and at least three kinds of bacteria. 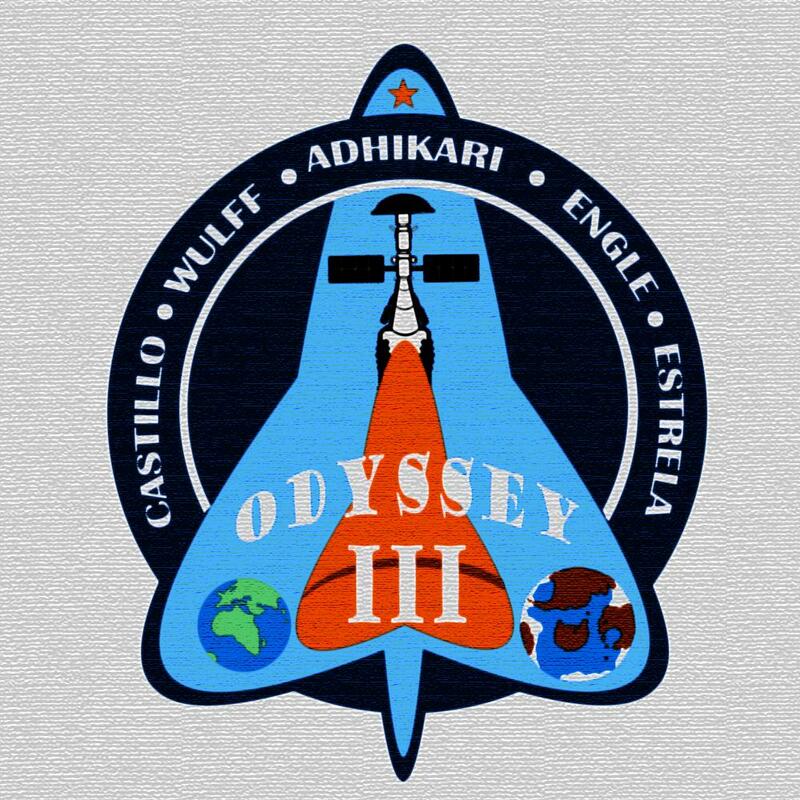 It was the crew of Odyssey III that discovered this unfortunate intrusion of Ilion’s biosphere. But it was too late. Before the message reached Earth, a fleet of ships was already en route to Barnard’s Star, carrying a large crew, a research boat, and the makings of a greenhouse: how else could they feed nine astronauts for a year and a half? Unaware of Odyssey III’s findings, the Aeneid I team set up camp on the coast of Aeneas and grew their potatoes, cabbage, and leafy greens and ate like kings compared to their predecessors, who subsisted on nutrient loafs, supplements, and “enrichment” foods for sanity’s sake. The crops were contained in a sturdy greenhouse built for bidirectional security, keeping the outside out and the inside in. In the testing phase, it worked spendidly. But there is a difference between testing hardware on the Philippine island of Mindanao and puting it to use in a poorly studied tropical coast six lightyears away. Once again, the limits of engineering shook hands with the unknowns of exploration and human error. The potatoes, brassicas, and cabbages found themselves on the wrong side of the canvas composite barrier separating green from red and manned exploration of Ilion came to a halt. The public reacted as one might expect. One side argued that Ilion was our ticket to the greater universe, the first stepping stone out of our lonely arm of the Milky Way. Ilion had no intelligent life, no civilization that we could see; wasn’t it humanity’s destiny to fill that void? No, cried the conservationists. This blue and red pearl in the sky was just another sad story of men ruining everything they touched, a reverse Midas of sorts. Let us continue to explore, but responsibly. Thus was born Helen of Troy, “the ship that launched a thousand probes.” Over a hundred robotic probes of various types sailed toward Barnard’s Star on six identical spacecraft. Some were simple, some complex; there were walkers, crawlers, fliers, and swimmers among them, but most importantly, all were completely sterile. Quietly, they studied life unseen by human eyes. They watched as Earth’s little green visitors integrated into the biosphere and exerted an influence that was subtle at the start, but grew as time passed. 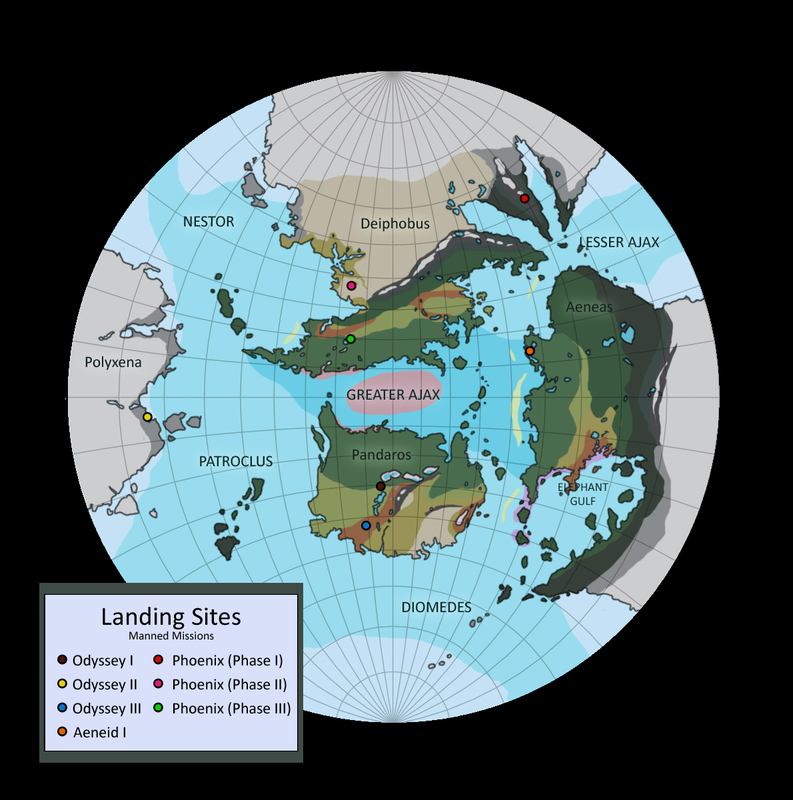 Intentional or not, mankind’s first terraforming project was underway. Phoenix signaled the shift from conservation to colonization. Phoenix was a three pronged, privately funded mission. 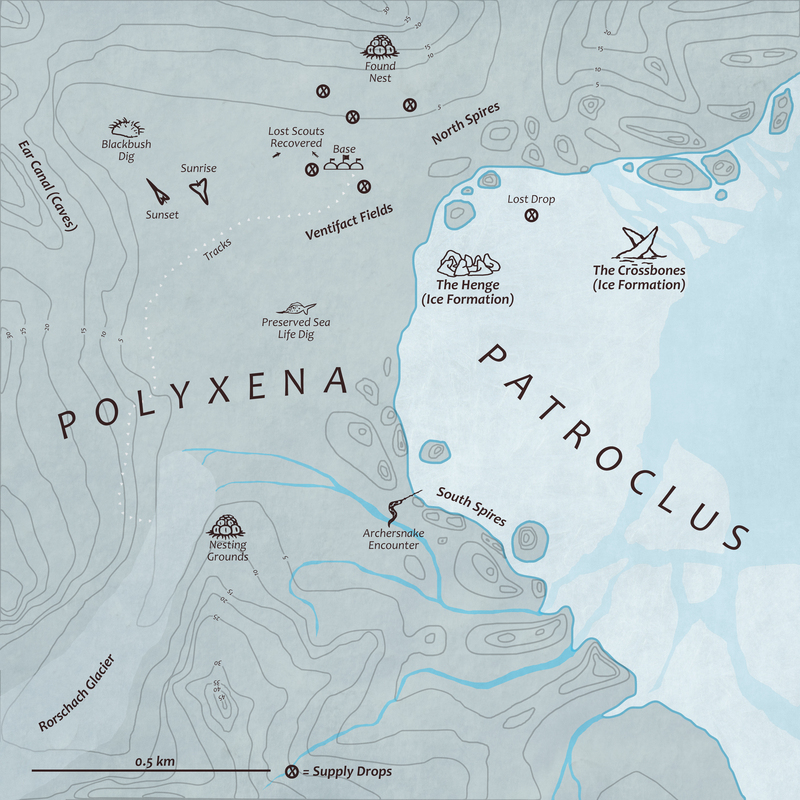 One crew of four was sent to the Deiphobus Desert to examine the geology and habitability of the region. A second pair landed at the base of the Arcadian Mountains, scaled Mt. 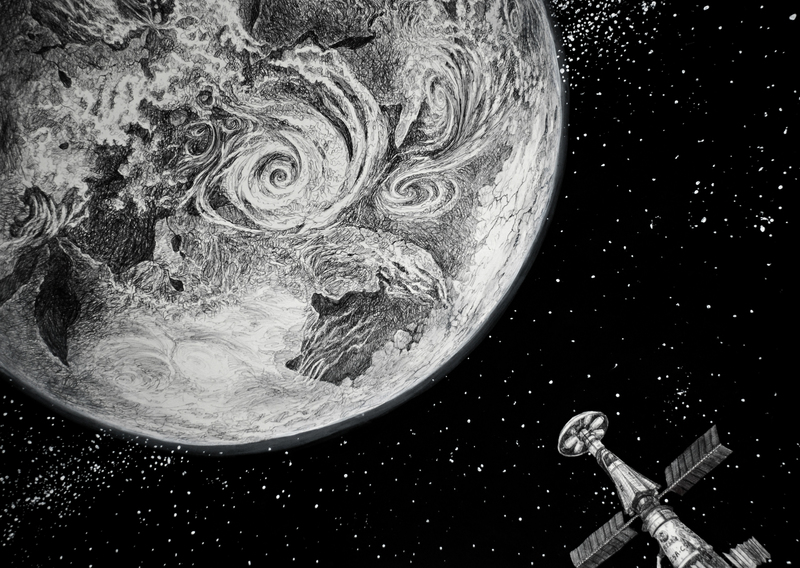 Flat, installed several instruments for atmospheric study, and returned to orbit. They came back with a third and fourth crewmember to explore the redcap forests near the south coast. The purpose of this leg was to search for lifeforms that might be of interest to the pharmaceutical industry. The desert crew returned to Phoenix on the same day to take over ship operations.